After an eight-year-old boxer dog named Dylan died after being diagnosed with a brain tumor and suffering from cardiac arrest, his owners, a British couple named Laura Jacques and Richard Remde, decided to clone him. When Dylan died in June, the grieving couple began research on the cloning process, ultimately deciding on using the South Korean-based Sooam Biotech Research Foundation — for a mere $100,000. According to the Guardian, Jacques and Remde took samples of their dead dog and delivered them to Sooam. 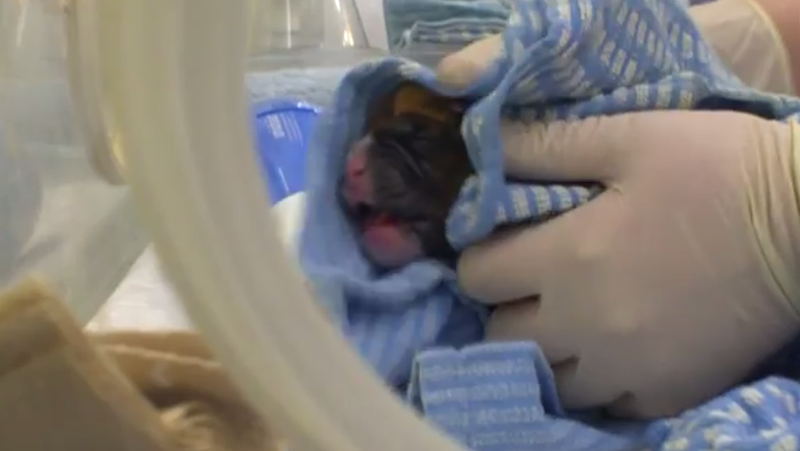 Multiple samples were extracted from the pup, with Remde having to fly to South Korea twice, until the firm was able to successfully perform the cloning. The male puppy, which they named Chance after a character in the Disney film, Homeward Bound, was born on December 26. The couple flew to South Korea to witness his birth. “After they got him out I still couldn’t quite believe it had happened,” Remde said. “But once he started making noises I knew it was real.” He described the dog as having the same exact patterns on his body as Dylan did. Another puppy is expected to be born in three days.